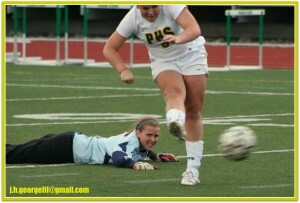 Parkview scored all three goals against the wind in the first half. 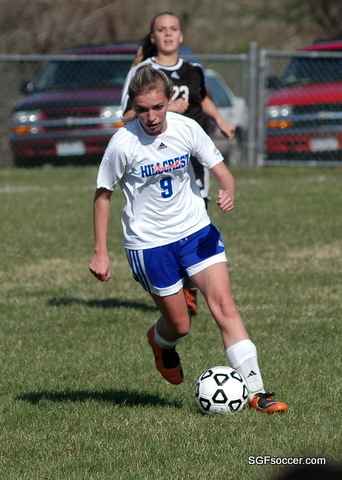 Junior Kelsey Loderhose led the scoring with two goals and an assist. Loderhose was assisted by Shelby Stewart and Jessica Maerz. Rolla tied the game briefly on an unassisted goal by Jaclyn Standfast (Missouri S&T recruit) before Loderhose got her second. Stewart scored the third goal. Emily Boyer scored in the 18th and 34th minutes. to give Lebanon a 2-0 halftime lead. Lebanon added two more goals in the second half. Emilee Starnes scored in the 5th minute of the half and Stephanie Speer added the final goal in the 37th minute of the half. Emily Cline scored two goals in the first 8 minutes, both from inside the 6 yard box, to give the Falcon’s an early lead at Cooper Soccer Complex this evening. Molly Brewer added a goal, scored from 25 yards that slipped under the bar into the wind, in the first half. Final stats are Emily Cline (3G), Molly Brewer (2G), Katie Brewer (1G), Mindyrose Moffe (2A), Lindsey Sprouse (1A). From the Lake Sun Leader: Freshman striker Miriam Taylor scored four goals to lead Camdenton in a 10-0 hammering of the Hillcrest Hornets. 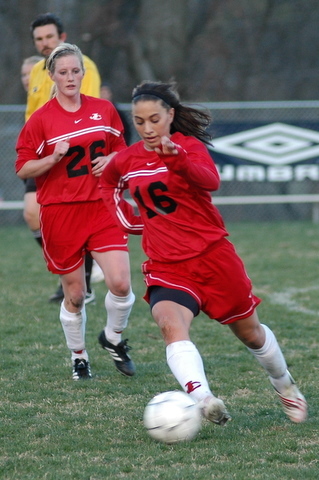 The 51-minute mercy rule victory on Tuesday night marked the Lady Lakers’ third 10-0 win of the 2010 campaign. Taylor had a natural hat trick in the first 18 minutes of the match and scored her fourth goal to cap off a long dribbling run in the 44th minute. From the Waynesville Daily Guide: Springfield Kickapoo junior forward McKenna Adams scored a goal and assisted on two others to help the Lady Chiefs topple the Lady Tigers 3-0 Tuesday night at Slaughter Field. It was Waynesville’s Ozark Conference opener. 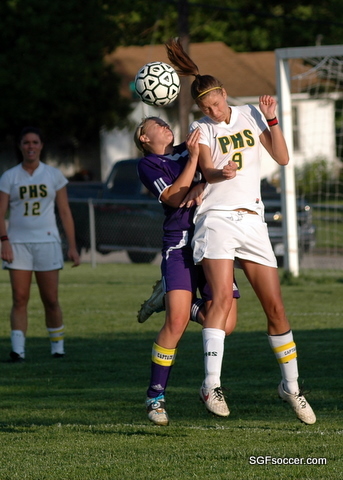 “She’s vicious,” WHS head coach Mike Gow said of Adams. ‘When she’s in the game, they look to her. She can just drill that ball from outside.” All three Kickapoo goals came in the first half, but Waynesville (1-3, 0-1 Ozark Conference) was effective stopping Adams the second. The WHS defense clamped down on her and she only got a few touches. In an entertaining game that featured a pair of teams that will rely heavily on youth, it was the Hornet’s who struck first this evening. Starting with a 50/50 ball won in the middle by sophomore Shanon Thomas, her midfield partner Raechal Gramm picked up the loose ball and sent senior Courtney Busby down the right side. Busby’s speed and hard work was rewarded when she lofted a cross to the far side that was met by sophomore Cassie Farrell perfectly, heading it past the keeper in the 47th minute. The Tiger’s, surprised by the athletic and hard tackling Hornets, fought back and put tremendous pressure on the Hornets who calmly responded to the challenge. It was only a 79th minute direct kick (see below) by freshman Miriam Dashtipour that allowed the Tiger’s to continue play. Two scoreless overtime periods led to penalty kicks which were won by the Hornets. Hillcrest scored two out of the first four and while the Tigers had three shots blocked by Hornet’s goalkeeper ? and the final shot went wide, giving the Hornet’s the win on a 2-1 margin. Shelby Hatz led the Irish attack with two goals and two assists, Ronnie Renner scored two goals and an assist. Bekah Bade, Jordan Banasik, Carsen Baron, Courtney Devlin, Rebecca Mayus, and Emily Ortega each scored for Catholic. Bekah Bade, Courtney Devlin, and Carsen Baron each recorded two assists, and Mandy Bailes had an assist. Rachel Scott and Megan Goetzinger combined for the shutout in goal. Graham, Klemp and Murray all score for Lady Hornets. The Tigers got goals from eight different players this evening in earning the shutout win at Branson. The Tigers (1-1) scored four goals in the first half and four in the second to dominate the Pirates and gain some momentum after a 4-0 loss at Jefferson City Helias in their season opener last week. Those scoring in the first half for Waynesville were senior Leslie Holsather, sophomore Sarah Dowling, senior Jorgie Dacamara and freshman Jordan Kilthau. In the second half, freshman Loriann Clark, sophomore Jesslyn Clark, senior Alicia Otero and freshman Janelle Miller were the WHS scorers. The Liberators took a 1-0 lead into halftime only to see the Tigers come storming back to earn the win on three goals in the second half. 7 different Lady Lakers scored goals in the match. 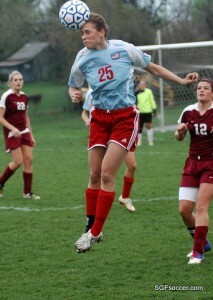 The Zizzer’s gave up a goal on a header by Olivia Cox off a cross from Kaylyn Stoll in the 5th minute. It would hold up for the game-winner. Senior Emily Boyer scores unassisted to get the Yellowjackets the win. The Eagles got goals from Lauren Moats, assist by Ashlyn Robillard; Moats, assist by Courtney Frerichs; Kelsey Bartel, assist by Rachel Murphy; Kelsey Haist, unassisted; Murphy, unassisted; Maddie Chandler, PK; Moats, unassisted while Kristin Miller earned the shutout. Nixa plays tomorrow at Parkview’s grass field 4pm Varsity game. Nixa’s next home game is Monday April 5th against Camdenton at 4:30pm JV and 6pm Varsity.